1. Heat the oil in a frying pan and cook the onion for 3 minutes until beginning to soften. Stir in the garlic and cumin seeds, cook for a minute then add the drained beans and paprika. Cook for 3 minutes more, then add a splash of water to the pan and mash the beans with a fork or potato masher until you have a coarse paste. Remove from the heat and set aside. 2. Bring a medium saucepan of water to the boil then add the broccoli and cook for about 3–4 minutes until tender but still firm. Drain well. 3. Meanwhile, scoop the avocado flesh into a bowl and mash well with a fork, adding the lime juice as you go. Stir in the chilli, tomatoes and coriander. 4. Warm the flour tortillas in a dry frying pan set over a medium heat or in a microwave. Spread a few tablespoons of the black bean mixture into the centre of each tortilla and top with a quarter of the broccoli. Spoon over some of the avocado mixture then sprinkle with grated cheese. 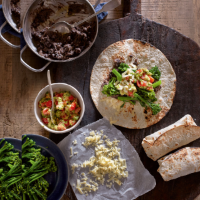 Roll up the tortillas tightly, tucking in the ends, then serve. This recipe was first published in Tue Dec 15 11:59:00 GMT 2015.